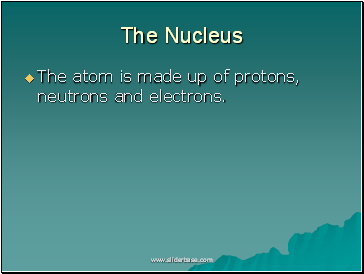 The atom is made up of protons, neutrons and electrons. Positively-charged protons and electrically neutral neutrons are located in the nucleus. Each proton has one positive charge or +1 so each nucleus has a positive charge equal to the number of protons that it has. The number of protons is called the element’s atomic number. Atoms contain the same number of protons as negatively-charged electrons. The electric attraction of opposites pulls the electrons close to the nucleus. 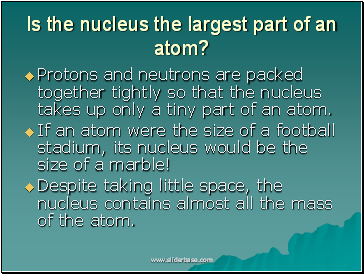 Is the nucleus the largest part of an atom? 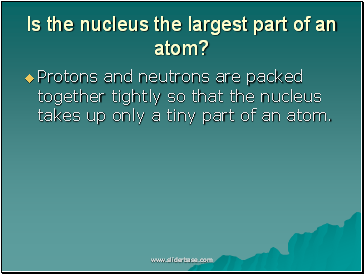 Protons and neutrons are packed together tightly so that the nucleus takes up only a tiny part of an atom. If an atom were the size of a football stadium, its nucleus would be the size of a marble! 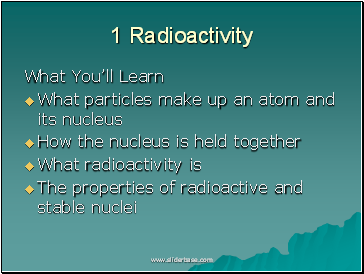 How can alpha particles harm you? 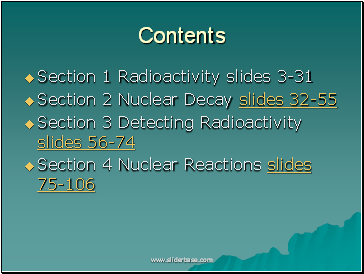 What is a bubble chamber?